If you are considering Rhinoplasty in Seattle Washington contact Seattle facial plastic surgeon William A. Portuese – a board certified facial plastic surgeon seeing patients in Seattle Washington and surrounding areas like Bellevue and Kirkland WA. Board certified facial plastic surgeon in Seattle Washington – William Portuese MD specializes in rhinoplasties – broken nose surgery, offers before and after photos, and the experience and credentials in helping you look your best. Your surgeon when searching for rhinoplasty near me. 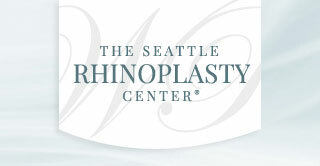 The operation is the most common procedure done at the Seattle Rhinoplasty Center in Seattle Washington. A private consultation with Dr. William Portuese will last approximately one hour in our Seattle office. There are many reasons why surgery is performed such as reducing a large hump on the nose or other areas of the nose that are out of balance with the rest of the facial features such as a wide nose, a wide, boxy, bulbous tip. 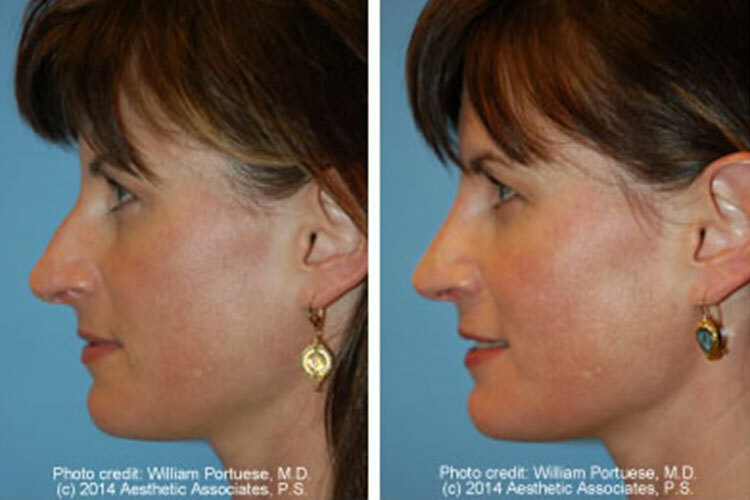 A droopy nasal tip can also be elevated to improve the aesthetic profile. A fractured or broken nose can simply be reset back to its normal pre-injury state. A nose job can be performed at the same time as a broken nose repair if a cosmetic change is desired. Typically, any cosmetic surgery is billed directly to the patient, and any functional or reconstructive surgery is billed to the patient’s healthcare insurance. A fractured nose typically makes the nose look crooked both in the cartilaginous and bony compartments whereby the nose bones are fractured, and sometimes a spreader graft of structural cartilage will have to be performed to widen a pinched upper lateral cartilage. Revision rhinoplasty surgeries are also performed at The Seattle Rhinoplasty Center on a frequent basis for complications arising from previous surgery done elsewhere. A nose job is an operation that changes the shape and form of the external portion of the nose. This is considered cosmetic surgery and is not related to the function of breathing. A straight septum is the cartilaginous and bony partition between the left and right sides of the breathing passageways inside the nose. It becomes deviated either from congenital reasons or from a traumatic injury. A deviation of the nasal septum can cause obstruction of the nasal passages, usually involving one side but occasionally can involve both sides of the nose. What is septoplasty surgery? A septoplasty is used to straighten out the deviated nasal septum for improvement of airflow through the nose. A septoplasty can be done at the same time as a nasal contouring; however, it is not done for cosmetic purposes. A septoplasty configures a straighter breathing passageway out of the inside of the nose. How long does rhinoplasty in Seattle last? Typically, nasal surgery lasts approximately one to one-and-a-half hours and is done under general anesthesia. What kind of anesthesia is used for nasal surgery? Typically, nasal surgeries are all done under a general anesthesia, lasting approximately one to one-and-a-half hours. Anesthesia is administered by board certified physician anesthesiologists from Swedish Medical Center located in Seattle Wa. Is there any packing placed on the inside of the nose after rhinoplasty and nasal surgery? There is no packing whatsoever placed on the inside of the nose. This was very common over 20 years ago when many surgeons were packing noses unnecessarily, which lead to severe pain and discomfort. Since there is no packing on the inside of the nose, nasal and nose surgery is uncomfortable but only minimally painful. How do I choose a Seattle facial plastic surgeon? It is a very important consideration to find a facial plastic surgeon who has extensive experience in rhinoplasty and revision rhinoplasty surgery. It is also very important to have a board certified surgeon who knows the intricacies and internal nasal anatomy such as an ear, nose, and throat doctor (otolaryngologist). A board certified ENT doctor combined with a board certified facial plastic surgeon is someone who probably performs many rhinoplasty surgeries on a routine basis. Seattle facial plastic surgeon Dr. Portuese has these credentials. Can rhinoplasty be performed at the same time as a septoplasty? Yes, many times a cosmetic rhinoplasty can be performed at the same time as a septoplasty surgery for functionality and improvement of breathing. Cosmetic nasal surgery ( rhinoplasty ) is always paid for by the patient and is not submitted to insurance. Any medically-related breathing disorders such as a deviated nasal septum and swelling of the inferior turbinates are billed to the patient’s medical insurance when medically necessary. Can a nose job and sinus surgery be completed at the same time? Yes, in many cases, patients who undergo Seattle surgery are having their sinuses opened simultaneously for chronic sinus disease. These two procedures can be done concurrently and is done quite frequently in our accredited surgery center. The chronic sinus-related disorders are submitted to insurance for medical necessity. The cosmetic portion of rhinoplasty is paid for by the patient. What is the minimum age to have a nose job in Seattle WA? How long must I refrain from exercise after nasal surgery and/or nasal surgery? For any type of nasal surgery including a rhinoplasty, septoplasty, or sinus-related surgery, it is important not to exercise for two weeks following a nose job in Seattle. Facial plastic surgeon Dr. Portuese wants patients to keep activities to a minimum to prevent a nose bleed. Patients should refrain from flying in an airplane for two weeks after nasal surgery. How long will the swelling last after surgery? A: Typically, the majority of the swelling subsides in the first two to three weeks after nose surgery. Bruising tends to last approximately ten days. 70-80% of the swelling is gone from the nose within the first month; however the residual 20-30% swelling in the tip of the nose can take upwards of a year to go away. What types of stitches are placed inside the nose ? A: All stitches on the inside of the nose are dissolvable. There are no permanent sutures on the inside of the nose and they dissolve within the one week postoperative period of the rhinoplasty. Where are the incisions for a rhinoplasty? A: Seattle board certified facial plastic surgeon Dr. William Portuese – Seattle Facial Plastic Surgeon places all of the incisions on the internal portion of the nose and does not perform an open rhinoplasty. There are no incisions across the lower columnella portion of the nose.